Pest Size: Fleas measure 1-4mm. Hazardous Level: Fleas are a serious health hazard. Multiplication Level: Female fleas lay several hundred eggs in her lifetime. Fleas are small, black to brownish - black, wingless insects with legs used for jumping and crawling. Fleas measure 1-4mm. They live off of blood much like ticks and mosquitoes. Fleas can be very tricky chemical alone won't do the job we use a growth inhibitor that prevent the flea from maturing and reproducing that along with the chemical is sure to get the job done. We do a thorough spray of all baseboards,floors especially carpeted areas and furniture if needed. Sometimes in extreme situations require a second spray that would be Covered in our 90 day warranty. Are Fleas hazardous to humans? Yes. Fleas are a serious health hazard due to their numbers and world-wide distribution. 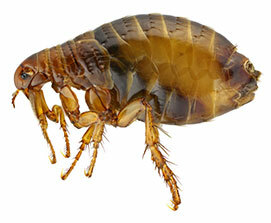 Fleas can carry harmful diseases. A reaction to a flea bite is an allergic reaction, which can form a secondary infection due to scratching. Fleas are common in Hamilton, and the surrounding area. Fleas are hard to kill because they are so small, and have hard bodies, so even if you smack them, you'll do very little damage to them. The female flea lays several hundred eggs in her lifetime. Eggs hatch in about 10 days and become adults in about 3 months. A flea infestation can number in the thousands. If I have a flea infestation, what can be done to eliminate them? Flea control can be a difficult and time consuming project. It is recommended to seek the services of a trained Pest Control professional to eliminate pests for thorough results. We have several strategies that work in conjunction with one another to eliminate fleas from your home. How are fleas getting in my home? Fleas typically enter into the house through pets, as well as rodents and raccoons that may have gotten into your house. Fleas are known to live on squirrels and raccoons which can jump to pets from shrubbery and branches. Get Rid Of Your Pest Problems! This entry was posted in Pests on 2013/08/23 by Any Pest.